The following is a contribution from Kalie at Pretend to Be Poor. If you’d like to contribute to Frugal Rules, please contact us. Indeed, sometimes generous grandparents, extended family or friends may unwittingly undermine lifestyle or parenting goals with well-intentioned but overblown gifts. Over-gifting is a messy topic for all involved, but there are practical and proactive steps you can take to promote cheerful giving and receiving. Wanting a say in the gifts your children receive doesn’t make you a Grinch. Some families may not have the storage space or the battery budget for certain toys, or may feel that the volume of presents doesn’t fit with their simple lifestyle. Whatever the reason for wishing to limit their children’s gifts, parents don’t have to remain entirely at the mercy of well-meaning over-gifters. Your attitude will speak louder than words when communicating with loved ones about limits. Strive to start from a place of gratitude for others’ generosity when dealing with this touchy topic. And recognize that you can make your requests known, and do with gifts as you wish, but cannot control others’ choices. 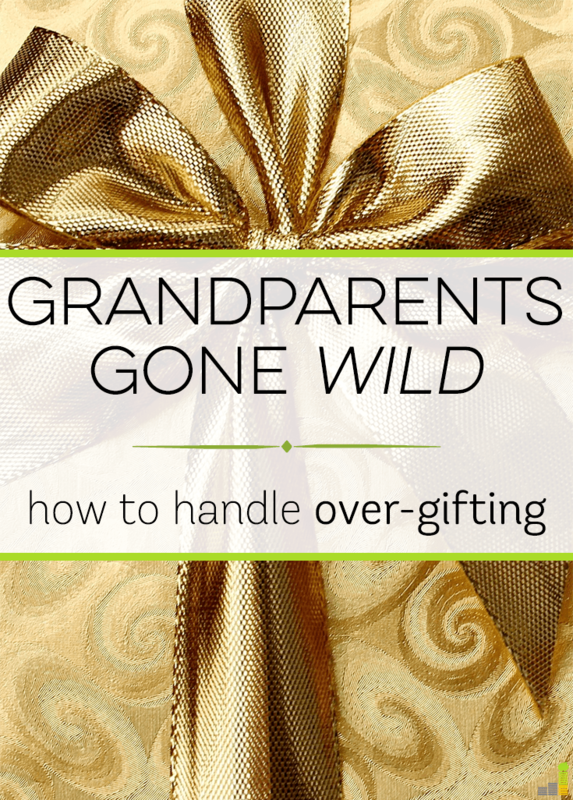 With this outlook in mind, let’s look at some ideas for handling over-gifting. Instead of being blindsided by baby’s first over-consumption Christmas, chat with your spouse about what gifting looked like in your family. Did you wake up to mounds of presents from Santa, or receive a few treasured items? Were the gifts typically fancy or simple? Did Santa consult your wish list or surprise you? The answers may alert you to diverse traditions. If one spouse comes from a family where gifting was highly valued or extravagant, you might need to be especially proactive in setting limits with that side of the family. The spouse from that side of the family may have the most success with this conversation. Whoever initiates this talk, both spouses should be in agreement about the tone and main points. It’s not worth dividing your marriage over toys—even if they have a gazillion pieces or require batteries sizes you can’t find at the grocery store. This type of conversation can begin before the holiday season. Without being judgmental, explain some of your lifestyle choices to family members. For example, you might mention that you’ve planned to limit the number of Christmas gifts you give each child. If you identify with an approach such as simple living or minimalism, describe what this means to you, why you’ve chosen it and the benefits you believe it holds for your children. Family dynamics vary when it comes to shopping season requests. If relatives usually ask for ideas, consider creating wish lists for your children (with their help). Retailers such as Amazon allow customers to create online wish lists. It isn’t greedy to provide suggestions to those who ask; I enjoy shopping for gifts I know someone will use and enjoy. If you or your family isn’t interested in online wish lists, be ready with a couple of ideas when people ask. For example, you might talk about how much you value classic, stimulating items like books, puzzles, and blocks. If you know a family member who likes to shop for clothing, you could let her know what items your child needs, and in what size. If you don’t mind pre-owned items, let givers know you’d love to minimize waste by receiving used goods. Kids don’t care if something is new—they care if it’s fun! There are so many secondhand and thrift stores that sell good quality, gently used kids’ clothing and toys. We’ve suggested this to our families, and my mom has found like-new shoes, clothing, jackets, boots, and sports equipment that my children love. A class, such as music or swimming. A membership, such as a zoo or children’s museum. Tickets to a movie or live performance. The college fund is truly the gift that keeps on giving and grows with the child as interest compounds. For interested givers, emphasize how the fund will result in real, lifelong value for the child, unlike more toys and trinkets. Point out that contributions are tax deductible for the giver, and provide the form they need so they can contribute directly to the fund. Share your wishes for limiting the size, number or type of gifts. For example, one mom requested no large toys when their home did not have a garage or basement. Or you might suggest that one or two gifts per child would be plenty. What to Do With Extra Gifts? Ask the gift-giver to store it at their house. Return the gifts if they are unassembled and you have a gift receipt. Sell the gift on CraigsList, eBay or a children’s secondhand store. Save it to re-gift at a later date, such as a birthday party. Donate the gift to a children’s charity. Remember to handle this sensitive situation with tact. If you are asking the giver to keep the present at their house, explain your reasons, such as not having room to store it. Be firm but kind, and avoid arguing. Ultimately, a recipient is free to do what they like with a gift. At the same time, keep the value of the relationship in the balance and be willing to compromise if appropriate. Of course, the older children get, the more difficult it will be to sell, donate or return gifts after they have been opened. This makes it all the more important to describe your requests and limits in advance. For gifts that you sell or return, considering letting the child decide what to do with the money (within reason for their age). Express gratitude for all generosity, and reinforce appropriate gifting by going out of your way to thank the person after the holidays. Send a thank you note describing the child’s ongoing interest in the item. Have the child write or draw a card to accompany your note. Include a picture of your kids playing with their gifts, or send one digitally. I once received a 30 second thank you video message for a child’s gift, which I found thoughtful and fun. In the end, how you navigate over-gifting will depend on the dynamics of your family relationships. Focusing on the deeper meaning your family places on the holidays may help alleviate some of the angst surrounding this issue. Love, peace and joy can transcend even the loudest and largest of toys, as parents already know from experience. What are your tips for handling over-gifting? Do you specify to family members what kind of gifts would work best for your family? How do you handle family members who want to give above and beyond what you’d really like? Kalie blogs at Pretend to Be Poor about the adventure, humor and generosity that can result from a financially flexible lifestyle. When she isn’t blogging, she’s busy raising two young children. Grandparents gone wild! I love it! I think the 1500 mile distance between me and my parents has put a limit on the amount of toys that my parents buy for my son, but they do really love to give gifts. As do my in-laws. We asked my mother-in-law to keep some toys at her house, and that went over well (especially because there is another grandchild who can use them too). I know that my granparents went a little crazy when I was young, but as I got older that my grandparents started to give gifts that were practical given my interests (tennis lessons or a gift card to a sports store so I could buy new athletic shoes). I think it’s wise to start these discussions early on with your parents even if they cannot possibly resist buying the Thomas the Train that your son insists he wants. Especially as kids get older and their interest become more expensive, it’s great to have the help of grandparents. I know my grandparents contributed to my gymnastics fees at times. Between Santa and trips to both grandparents’ houses on Christmas day, my kid definitely gets a little overwhelmed with the gifts by the end of the day. It’s hard for me to tone it down though. My grandmother was a real Santa who gave us all tons of gifts, and my Dad is following family tradition. He only sees us a few times per year, and wants to “make up” for the lack of time. Knowing the situation we’re in with our parents, sometimes the best thing is to just smile and say thanks. I completely agree that understanding where grandparents or other givers are coming from and respecting their desire to be generous is important. I’m glad you’re able to smile and accept! All of their grandparents have been pretty reasonable so far. With that being said, I have totally sold my kids gifts before and put the $ in their college funds. When they were babies especially, we had lots of duplicates. Babies do seem to attract repeats of popular gift items. Selling them for college fund contributions is a great idea. We are kind of in the smile and say thanks camp. I’ve tried to get my mom to tone it down but she likes the grandkids to have lots of presents. I do try to ask for things we need like shoes for dance class or this year we asked for a Chromebook. It would be different if they couldn’t afford it but my parents are pretty well off. Who am I to judge how they like to spend their money? Making suggestions while gladly accepting their generosity is a wonderful approach! Clever and effective tips! I think this is something that all new parents (like me) need to read. You mentioned how it mostly just creeps up on you. So true. As you said, commuincation is the key. And that also means understanding family traditions. Sam is only 10 months old, so it won’t be too difficult for people to not go overboard this year, but it’s something we’ve made clear to everyone for the future (and we have a lot of extended family). Love the idea of giving class or experiences rather than the traditional gifts. Great article! It definitely helps to be proactive. While some family members may wish to give lots of gifts no matter what, others may be relieved to know you’re not expecting expensive presents. Overgifting is definitely a problem with both sets of grandparents. I plan to go through the kids’ toy room in the next few weeks and thin things out considerably and donate the excess to charity. It will help make space for the new toys I’m sure they’ll get on Christmas. Making way for Christmas gifts is a great way to keep the new toy load manageable. I know some families “leave a bag of gifts for Santa” (i.e. donate them), or even pay children a small amount to give away of some of their toys, and then siblings use that money to buy each other small Christmas gifts. I don’t have kids, but I know if/when I do that the grandparents will spoil them to an extreme degree. My Mom literally can’t wait for us to have kids and I think she’ll be spending a ton of money on them. I’m thankful for not having to deal with this ‘problem’ anytime soon! It’s nice you know what to expect. And it’s only a problem if it actually bothers you. Gift giving year-round (not just Christmas) has been a major source of stress for my husband and I since having kids. Our families are both so generous, both with items that we request and things they just choose to pick out, and we try so hard to not seem ungrateful. But I think the constant gift giving (rather than just on birthdays and Christmas) makes it even a little more difficult. I think that it is slowly starting to sink in but both families still make comments that can feel like a subtle dig at our choice of lifestyle. I know that many family members say “it makes us happy to give” but I wish they would understand that it makes us stressed and takes some of the joy out of the holidays, especially as we try to navigate how to explain things both to the kids and to the family. Sigh. Thanks for these tips. It’s a reminder that we can keep trying different tactics. The continual gift-giving must be even more difficult to figure out. It’s awesome to have generous family members, but at some point you probably don’t want your kids expecting gifts all the time, either. I wish you the best with navigating this. This is our first Christmas with our daughter (or grandchild on either side) so we are a little interested to see what the gifting situation is like. Each side normally doesn’t over-gift but I have a feeling that a grandchild may change that. We have given each side suggestions on items that are needed and asked for gift receipts for anything that isn’t needed. Gifts are such a hard thing to tip toe around because it is hard to reject things that someone is giving to your family even thought you might not need it. Asking for gift receipts is a great idea! You’re right that it can be a sensitive topic so it’s good you’re being proactive. This is a great, timely post! The only thing re 2nd hand stuff as gifts is that shoes are generally not a good gift if they’ve been worn for any length of time (according to my podiatrist). Each of us wears shoes differently and breaks them in a certain way and it can have huge impacts on back / leg / foot pain later on, sometimes years later. Of course shoes are so expensive and it’s so tempting just to use hand-me-down (which we totally do for virtually every other clothing item! ), but shoes, unless extremely lightly used, are not a good idea. I am an over gifter, I am also someone who never had a Christmas. I think it is important to understand the reason behind why people do things. Sometimes we do it because we understand what it is like not to have, and we want our loved ones to experience something different. I am in my mid thirties and although I do not have a family, I do but I do not consider them a family, I have a select group of friends that I cherish. and I tend to over gift them. I’m trying to understand the reasoning myself behind it at times Still yet. Although I do agree that people should show their happiness in appreciation for the gifts that they receive, I think in terms of grandparents that reciprocation should also take place. I have never ever accepted more than I give. I think it is important that when people are thinking of you and your children that you try to focus on the positive of what is behind it, be thankful and appreciative of it, and I don’t think you have to match their gift giving monetarily but finding out what is important to them and doing that can’t be a bad idea. There are a lot less givers than takers in this world. Be thankful for that person that you know. 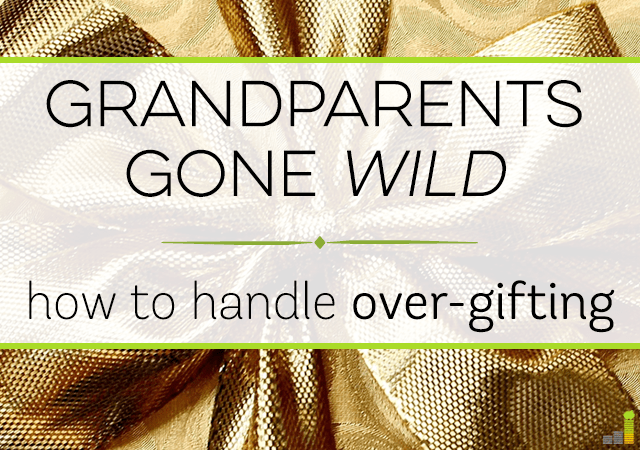 I wish I had a problem with over gifting of generous grandparents! My in-laws are so frugal that I hardly can stand it, she ( mother-in -law) can afford building a new house and buy all new gadgets etc, but only twice a year she would buy presents for grandkids, and she won’t pay more than $50 for them. She never had toys in her house.. or even special treats for kids. My parents would spoil grandkids- in a good way- but they live very far and aren’t rich at all. I think generosity of grandparents is a blessing..